FDA requires food facilities to renew their registrations between October 1 and December 31, 2014. Registrar Corp updates the industry on the requirements. The Food Safety Modernization Act (FSMA), signed into law in 2011 by President Obama, amended the Food, Drug, and Cosmetic Act to require food and beverage facilities to renew their registrations with the U.S. Food and Drug Administration (FDA) each even numbered year between October 1 and December 31. 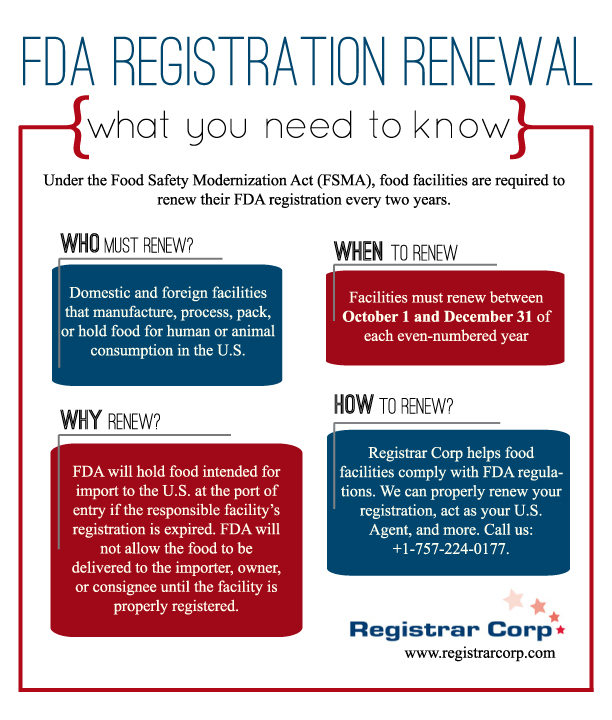 Any facility that registered with FDA before today will need to renew its registration by December 31, 2014. The requirement applies to all food and beverage facilities that manufacture, process, pack, or hold food for human or animal consumption in the United States. FDA will consider all registrations that are not renewed by the deadline to be expired. The number of food facilities registered with FDA has dropped significantly since the first registration renewal period in 2012. Before October 2012 there were 458,946 registered facilities. As of February 19, 2014, the number of facilities registered with FDA was 197, 328. According to FDA, this is largely due to facilities failing to renew their registrations in 2012. Distributing products in the U.S. with an expired registration is a prohibited act, and FDA will hold all food shipped to the U.S. by a facility with an expired registration at its port of entry until the facility is properly registered. Don’t let your registration expire. Renew your registration now to allow ample time for FDA to process your renewal and come back with any questions it may have. Registrar Corp is an FDA consulting firm that helps food and beverage companies comply with FDA regulations. Registrar Corp can properly renew your registration for you and will even send you a Certificate of Registration that you can use to assure clients of your up-to-date FDA registration. If you have questions about FDA registration renewal or would like assistance through the renewal process, contact Registrar Corp at +1-757-224-0177 or speak to a Regulatory Specialist 24 hours a day at http://www.registrarcorp.com/livehelp.